Having a clean medical office is very crucial to running a successful medical practice. Cleanliness is iportant for many reasons. It helps control the amount of germs that are on equipment and in the air. It also helps to prevent contagious diseases and viruses such as colds and flu. In addition, it protects both the health care workers and the patients. This is why it is so important to not only have a clean medical office but also to have a good medical office cleaning staff. There are many advantages to hiring a professional medical office cleaning staff. The number one reason should be that they clean your office better than a traditional cleaning staff. The reason is that they are trained to use special antiseptics and thoroughly clean equipment that other office cleaning companies are not qualified to properly clean and disinfect. We use quality disinfecting products and make sure that we thoroughly clean every object and surface in your office in order to prevent the transmission of harmful pathogens. In addition, we make sure that all proper safety precautions are taken so that there is never any cross-contamination. Cross-contamination by using the same rags or sponges can lead to serious consequences and put the patients, medical staff, and cleaning staff in danger. This is why it is so important to have a properly trained cleaning staff that will take every precaution to avoid the spread of pathogens and prevent cross-contamination with clean and dirty supplies and equipment. Proper cleaning and sanitation leads to the prevention of illness and disease. By having a good medical office cleaning staff, your staff and patients are always protected. A good cleaning staff will always use new or clean supplies such as sponges, towels, paper products, and mop heads. They will not reuse dirty cleaning water. They will thorougly wash their hands and use protective gear such as masks and gloves while performing each cleaning assignment. They will use proper antiseptics and other cleaners are they specific for cleaning medical facilities. In addition, they will have proper training and knowledge of not only how to use these antiseptics and cleaners, they will also know how to properly clean each area of a medical office. This prevents not only the transfer of harmful pathogens, but it also ensure that each area is cleaned properly and thoroughly. It eliminates the need for having to clean the office yourself so that you can focus on the services that your office is meant to provide at all times. Summit Janitorial is a leader in medical office cleaning. We have been in business for over twenty years. 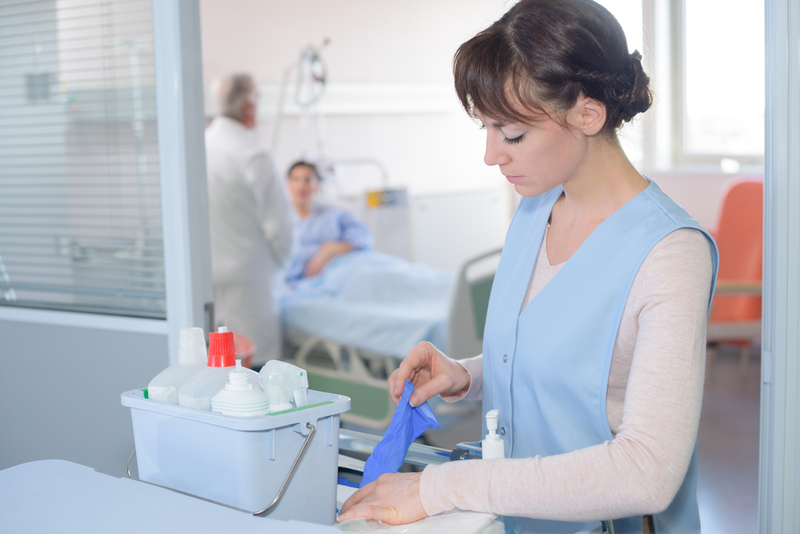 We ensure that all of our staff is properly trained on how to clean a medical office. We use only the highest quality medical-grade antiseptics and cleaning products. We hire quality staff and do thorough background checks on each of our employees. We provide quality and reliable cleaning services. At Summit, we guarantee that you will be satisfied with how we clean a medical office and feel like you can trust us a reliable cleaning service that specializes in medical office cleaning and sanitation. Contact us today to find out more about or medical office cleaning services.